Colonel Moses died of pneumonia on 26 September, six days after being evacuated to the hospital ship, USS Solace. He was succeeded by Major John H. Russell, Jr., who later became the 16th Commandant of the Marine Corps (1934-1936). The 3d Regiment left Vera Cruz on 23 November, arrived at the Philadelphia Navy Yard on 4 December, and was disbanded the following day. The regiment was reactivated on December 20, 1916, from assets of the 1st Marine Regiment in the Dominican Republic. They were attached to the 2nd Brigade and deactivated on August 1, 1922. The 3rd Marine Regiment was reactivated on June 16, 1942, at New River, North Carolina, as part of the World War II military expansion. They deployed to American Samoa on September 14, 1942, and were attached to the 2nd Marine Brigade. The regiment redeployed to New Zealand on May 23, 1943, and were reassigned to the 3rd Marine Division at that time. The regiment fought at Bougainville and Guam. Four Medals of Honor were awarded to members of 3rd Marines for actions during this period. Members of the unit also took part in the Agana race riot while stationed on Guam. During the Battle of Iwo Jima the 3rd Marines were keep in Reserve and were not sent ashore. 3rd Marines was one of the first Marine units into South Vietnam when it provided security for the Da Nang Air Base in early 1965. Ultimately, 3d Marines participated in 48 major operations in the Republic of Vietnam. The regiment departed South Vietnam in October 1969 and was initially relocated to Marine Corps Base Camp Pendleton, California and assigned to the 5th Marine Amphibious Brigade. 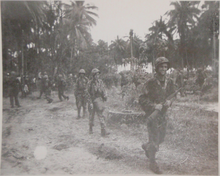 During April 1971, the regiment became part of the 1st Marine Division. Two months later, the regiment was moved to Marine Corps Air Station Kaneohe Bay, Hawaii, to assume the role of the ground combat component of the 1st Marine Brigade. 3rd Marines was one of the first combat forces to deploy to Saudi Arabia in response to the Iraqi invasion of Kuwait on August 2, 1990. The regiment, which became known as Task Force Taro in honor of the state and people of Hawaii, became the first American unit to be engaged by Iraqi artillery, rocket and missile fire on January 18, 1991. They countered the Iraqi supporting attacks by conducting artillery raids into Kuwait as the first ground offensive actions of the war. Task force Taro was instrumental in the recapture of Khafji, was the first unit to advance into Kuwait, conducted the only heliborne assault of the war and secured the Marine Corps' final objective of the war, Kuwait International Airport. The 3rd Marines has deployed to both Iraq and Afghanistan as part of the Global War on Terror. One of their officers, Stephen J. Boada, was awarded the Silver Star for actions there. He became the first Marine in the regiment and from Hawaii to be awarded one of the major awards for valor since the Vietnam War. An NCO from 1st Battalion, 3rd Marines, Cpl Kristopher Kane, was later awarded a Silver Star for actions during the Second Battle of Fallujah. The Regiment deployed to Afghanistan in late 2008 as Special Purpose Marine Air Ground Task Force - Afghanistan (SPMAGTF-A)and became Regimental Combat Team 3 during Operation Khanjar in Helmand Province, and returned to Helmand from late 2009 through May 2010, when it participated in Operation Moshtarak. ^ Benis M. Frank, A BRIEF HISTORY OF THE 3D MARINES, Air War College, accessed May 2012. Hereafter Frank, AWC. ^ Muster Rolls for 3d Regt, June 1911, via Frank, AWC. ^ Clyde H. Metcalf, "A History of the United States Marine Corps" (New York: G. P. Putnam's Sons, 1939), p. 302ff, via Frank, AWC. ^ "Muster Rolls," Field and Staff, 3d Regt, April 1914, via Frank, AWC. ^ "Muster Rolls," 3d Regt, Apr 1914, via Frank, AWC. ^ "Muster Rolls," for Marine Detachments of USS Arkansas (BB-33), USS Florida (BB-30), USS Louisiana (BB-19), USS Michigan (BB-27), USS Minnesota (BB-22), USS New Hampshire (BB-25), USS New Jersey (BB-16), USS South Carolina (BB-26), USS Utah (BB-31), and USS Vermont (BB-20), April 1914, via Frank, AWC. ^ "CMC Report," 1914, p. 304; Metcalf, "USMC Hist," p. 304. ^ "Muster Rolls," 3d Regt, September 1914, via Frank, AWC. ^ "Muster Rolls," 3d Regt, December 1914, via Frank, AWC. ^ a b Rottman, Gordon L. (2002). U.S. Marine Corps World War II Order of Battle – Ground and Air Units in the Pacific War. Westport, Connecticut: Greenwood Press. ISBN 0-313-31906-5. ^ http://starbulletin.com/2006/05/21/news/military.html. Although Kane's award predates Boada's, Boada's award was presented first.